My first thought when I heard this study result was thank God I don't drink anything "diet." 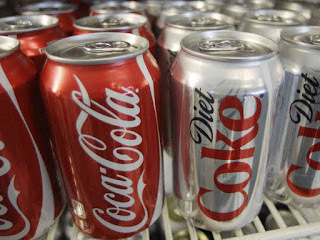 A new study by Honglei Chen of the National Institutes of Health in Research Triangle Park has linked drinking diet soda to an increased risk of depression in adults. Findings show that people who drink more than four cans or cups of soda were 30 percent more likely to develop depression symptoms, and that coffee has the opposite effect. CBS reports that those drinking four or more cups of coffee a day are 10 percent less likely to develop depression. For me, personally, I'm liking this statistic considering I'm a coffee addict who refuses to drink pop (or soda for non-Michiganders) with the word "Diet" printed on the label. I will point out that the study shows the risk is present for anyone who drinks excessive amounts of pop — but there's an extra risk for those who drink diet. Anyway, on a more serious note, is this something we should believe? I am definitely not saying, for those diagnosed with depression, to stop drinking pop cold turkey and use that as your only treatment. It's not a bad idea to stop drinking pop though because even diet soda is not healthy. But, looking closely at the findings of this study shows that diet soda may not cause depression. The study results only show that those who drink excessive amounts of pop are more likely to have depression. This is very much a case of what came first, the chicken or the egg? Are you depressed because you drink a lot of soda -- or do you drink a lot of soda because you're depressed? Nutritionist and NYU Professor Dr. Lisa Young told the Daily News, "The thing about soda is, you don't often drink it alone -- you drink it with junk food. You're not getting enough fiber and protein with that sugar, and your blood sugar not being stable could throw off your mood." "[The soda] could be safe, but I think it puts you into this pattern of not really eating healthfully." She points out that neither diet or regular pop is good for you — soda has many unnecessary calories and diet soda has many unnecessary chemicals. So what should you do? I would recommend drinking plenty of water because a lack of water can lead to depression more than drinking soda can. After all, 85 percent of our brain tissue is water. Rehydrating allows the natural brain chemicals to do their jobs. Another plus, if you're trying to lose weight, drinking plenty of water will help you more than drinking diet pop ever could.